The offerings and ceremonies that Maya people practice today are rooted in the reciprocal relationship between the Maya and their land. In the highlands of Guatemala, the K’iche’ Maya conduct the New Year ceremony at the beginning of the Tzolk’in or Chol Q’ij, the 260-day sacred calendar. In other regions, Maya communities maintain the customs of their ancestors through festivals and ceremonies connected with the growing cycle of corn. Rituals are petitions for rain or gratitude for a bountiful harvest, and reflect deep connections to the Maya lands and their calendar systems. Three ritual practices – Wajxaqib’ B’atz’, Sac Ha’, and Pa Puul – are traditions that have endured for millennia. Images used in the videos can be downloaded in the Resources Section of the site. Pa Puul or “Breaking Pots” is a Yucatec Maya (Mexico) festival celebrated on June 24th to petition for rain. Sac Ha’ or “White Water” is a ceremony performed by Yucatec Maya (Mexico) farmers during key stages in the growth cycle of corn. 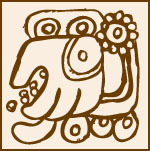 Wajxaqib’ B’atz’ or “8th of Monkey” is performed by the K’iche’ Maya (Guatemala) to celebrate a new cycle of the Chol Q’ij Maya sacred calendar.